Get your two cents in when it comes to the St. Louis region's future on transportation and air quality. The East-West Gateway Council of Governments wants your input on the 2019-22 Transportation Improvement Program and the Air Quality Conformity Determination. The TIP includes 778 projects with a $2.36 billion pricetag. You can see those documents at www.ewgateway.org/tipcomments. And comments are open through Oct. 5. East-West Gateway is the planning organization for Franklin, Jefferson, St. Charles and St. Louis counties, along with St. Louis and the Illinois counties of Madison, Monroe and St. Clair. So join the online chat on Thursday, Sept. 27, at noon to ask questions, submit comments and share ideas. Good Morning. Starting at noon, we’ll begin to answer questions on the draft FY 2019-2022 Transportation Improvement Program (TIP) and related Air Quality Conformity Determination and Documentation (AQCD). These documents are available for download at www.ewgateway.org/tipcomments. The public comment period is through Friday, October 5, 2018. Welcome to the online chat for the FY 2019-2022 TIP and AQCD. East-West Gateway staff will be available to answer questions on these documents until 1 PM today. The East-West Gateway Council of Governments is a voluntary association of local governments. The Council has been designated by the governors of Missouri and Illinois and the U.S. Department of Transportation as the metropolitan planning organization (MPO) for the St. Louis region to represent the interests of local governments and citizens in the transportation planning process. Since the Council was formed in 1965, it has been dedicated to assisting local governments in solving problems across jurisdictional boundaries. It is the only organization of local governments that spans the entire two-state St. Louis region. The Council itself is made up of more than 200 villages, cities, and counties in the eight-county metropolitan area. The agency’s 24-member Board of Directors consists of the area’s chief local elected officials and selected citizens. The TIP is the schedule for implementing projects receiving federal funds over the next four years. The TIP document includes 778 projects with a cost of $2.36 billion. This year there are 191 projects that are included in the TIP for the first time. Since the TIP is a four-year document, it includes projects in various stages of design or right of way acquisition, but which are not yet quite ready for construction. These projects can be ‘reprogrammed’ from the previous TIP as they progress. There are 587 projects that are ‘reprogrammed’ in this TIP. The listing of projects is included in Appendix B of the document. The TIP is required by federal law to be fiscally constrained meaning that the federal, state, and local funds will be available to implement the proposed projects. The St. Louis region is in non-attainment for ozone and small particulate matter. The AQCD demonstrates that the transportation programs and projects included in the TIP and long range transportation plan conform to the emissions budgets set by the states of Missouri and Illinois. How do you decide what projects in the Metro East get funded? Is it based on population proportion, need, or what? In addition: Who helps coordinate bridge restrictions/closures/construction projects that affect residents on both sides of the Mississippi River. For example: the MLK bridge is closed for a year. The PSB is always under construction, Coming off the Stan Musial into STL is another construction zone. Is there thought given to staggering projects to mitigate impact on residents? Is it strictly a things get done when there's funding approach? The distribution isn’t based on population of the Metro East. IDOT develops a program based on its own assessment of district needs and priorities as well available funding. This involves evaluating the physical condition of its system, accident rates, roadway congestion, and operational deficiencies. Based on that assessment, and with consideration to the principles of the East-West Gateway’s long range transportation plan, IDOT annually develops a seven-year program that is submitted to the Council for inclusion in the TIP. As far as coordination, MoDOT and IDOT do work together on projects that impact river crossings. However, sometimes the schedules may overlap to ensure the transportation system stays in a state of good repair. The Poplar Street Bridge work has been ongoing for two years and IDOT had been planning to do work to replace the bridge approaches to the MLK Bridge that were built in the 1950s and rehabilitate the bridge approaches built in the 1990s. A majority of the Poplar Street Bridge work is planned to be completed by then end of this year. We will pass your concerns along to MoDOT and IDOT staff. 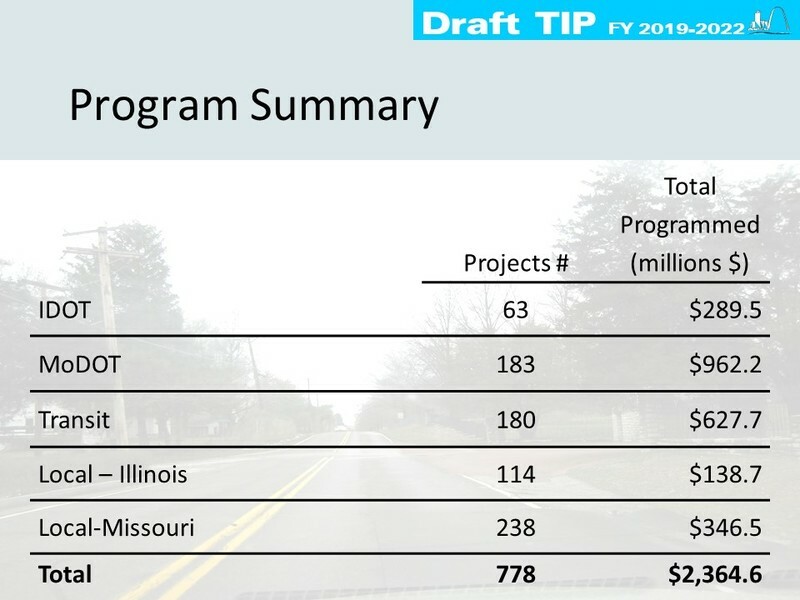 The draft FY 2019-2022 TIP has 778 projects at a cost of $2.36 billion. The previous TIP (FY 2018-2021 had 716 projects at a cost of $2.17 billion. The City of St. Louis was successful in getting federal funds for design and right of way acquisition for the Compton Bridge replacement. At this time construction is not scheduled, but as design moves along the City will seek additional federal funds for construction. Is the Jefferson/I-64 project on the list the implementation of the vision in plans to make the interchange with Jefferson more typical and the removal of the long ramps from Chestnut and Pine? Yes, the plans are to remove the bridges at the existing interchange between Jefferson and 14th St including the ramps from Chestnut to Pine and to make the Jefferson interchange a full access interchange. Currently, Jefferson is only accessible for eastbound drivers. The project will reconnect the street grid west of Union Station, construct outer roads between 22nd and Jefferson, construct an interchange at 22nd, as well as bicycle and pedestrian improvements in the vicinity. Do you know when Clayton Rd west of the city limits will be repaved? Or is that a question better asked to St. Louis County? Work on this project is underway. The actual asphalt resurfacing will take place sometime in the spring/summer of 2019. Given the growth in Jefferson County, there needs to be some planning to add more bridges across the Meramec River to accommodate north-south travel, between Jefferson County and St. Louis County, similar to the highway improvements between St. Charles County and St. Louis County (4 multi-lane bridges over the Missouri River in a 15 mile stretch). Currently, the only options are I-270 (via I-44 or I-55), MO-141 (which is already over capacity) and I-44 & MO-109 (in the Eureka area). Adding another connection in the Castlewood Park area, west of 141, and one connecting Larkin-Williams and Barrett station, east of 141, would help spread out the demand. Thank you for your comment. We will pass your comment along to MoDOT staff. Why doesn't the city adopt a process where residents can text or tweet pictures of potholes so that the city can fix them immediately? The roads in the city are the equivalent of corduroy, and the bad roads damage cars in the long-term, as well as decrease property values. You don't have that problem in the county. Who's accountable for this? Why not adopt a resident-driven system? That's what they're doing in Boston. Unlike the current direct westbound I64 exit into Clayton Rd. (in Ladue) there's no equivalent exit for eastbound traffic. To greatly relieve traffic congestion on southbound Lindbergh between I64 & Clayton Rd install a new dedicated I64-eastbound exit into the existing 2-way I64 Outer Rd (in Ladue south of the hwy.) that would better feed autos onto Clayton Rd. (& nearby Warson Rd). A project to add an eastbound interchange is not identified in this TIP or East-West Gateway’s long range transportation plan, Connected2045. We will pass this comment along to MoDOT staff. When will the city update its traffic lights so that they operate and change appropriately based on traffic flows? The lights on Jefferson in between I-64 and I-44 is an abomination. The lights change green for left turns when there is no one in that lane. It's ridiculous. Again, you don't have that problem in the county. It's not that difficult. Traffic signal coordination between I-64 and I-44 is done by the City and MoDOT. Is there a time of day that this is a problem? We can pass this info along to the appropriate staff for each agency. Please refrain from building projects that encourage people to live in places that are vulnerable to flooding or if not a direct threat at their property, leaves them vulnerable to being trapped by flooding nearby. In other words, don't encourage even more people to live in places that will be impacted by the next Mereamec (or other river) flood. Projects identified in the long range plan and TIP are consistent with the strategies of the long range plan. A strategy in the long range transportation plan is protect air quality and environmental assets. East-West Gateway has no jurisdiction over local land use decisions. Land use decisions are made by local agencies. Please bring Metrolink to Westport! Please! Those of us living west need a public transport option. How can we convince the powers that be in Madison County to engage further with East-West Gateway and consider a study related to MetroLink expansion connecting SIUE to the larger Metro area? This seems like a no-brainer to me. At this time, there is no funding identified for MetroLink expansion including Westport and Madison County. Transit funding is limited and is being utilized to operate and maintain the current system and funding is not available for expansion at this time. We are currently updating the long range transportation plan, Connected2045, and we need your help. Tell us about your needs and priorities for the region’s transportation system by taking this short survey. Completing the survey is easy and should take five to 10 minutes. I-70 west of I-64 is constrained by the railroad. MoDOT has identified funding to begin design of possible improvements in that area. This is identified in Appendix C of the TIP document. At this time there are no funds identified for construction. The comment period ends Friday, October 5.